With this set the hydraulic brakes #1515918 or #1515919 can be mounted on the gear shaft. The diameter of the gear carrier is 60 mm and fits for gears with 46 respectively 48 teeth. 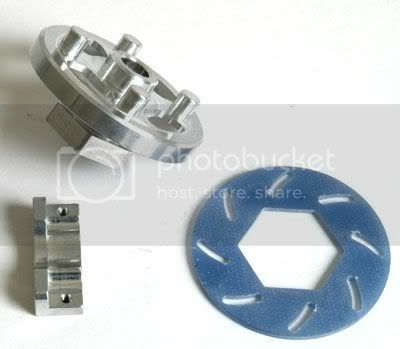 This conversion kit offers the possibility to use the BX-3 also with race series that just allow brakes on the gear shaft. But also with deep and muddy ground it might be an advantage not to mount the brakes in the wheels. Dit is mischien ook wel een mooie menemer voor de wws Rijders..